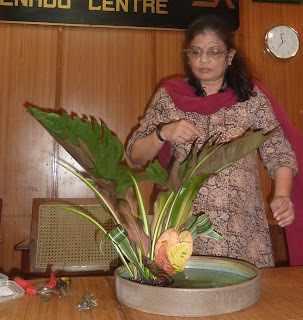 Twelve of us gathered on Oct 14th at the ABK hall to try our hand at this, with sensei Trishala demonstrating first off. Her first composition was a moribana. 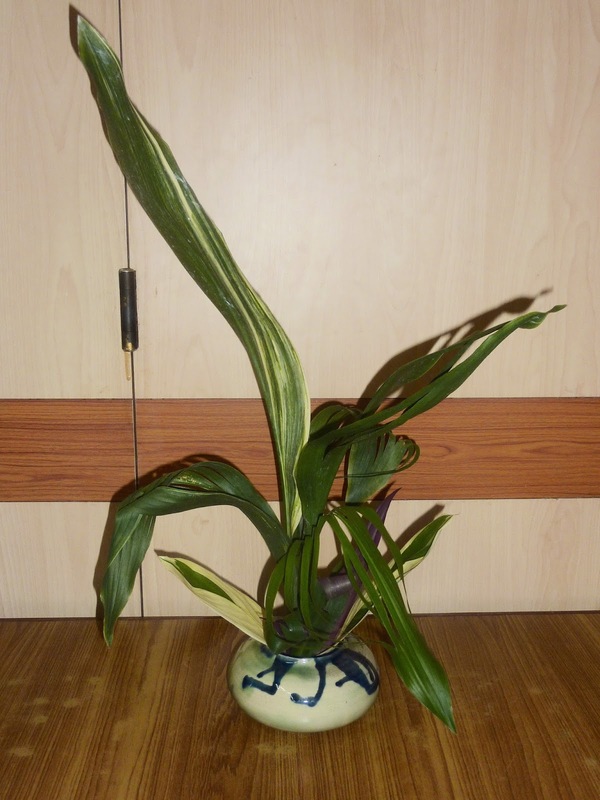 She used a large eart-coloured suibin, with a beautiful jade interior. Combining Clearodendron, Dressina, Pandanus and using the Crotons for a contrast in colour, the all-leaf omposition showed a lot of water, and the inner colour of the vase also formed part of the composition. For her second composition, Trishala used a ceramic nagiere vase. The vase had an interesting metallic sheen and texture, adding drama to the vase. We all wondered how she would tackle this vase, whcihc seemed to provide a challenge by itself! 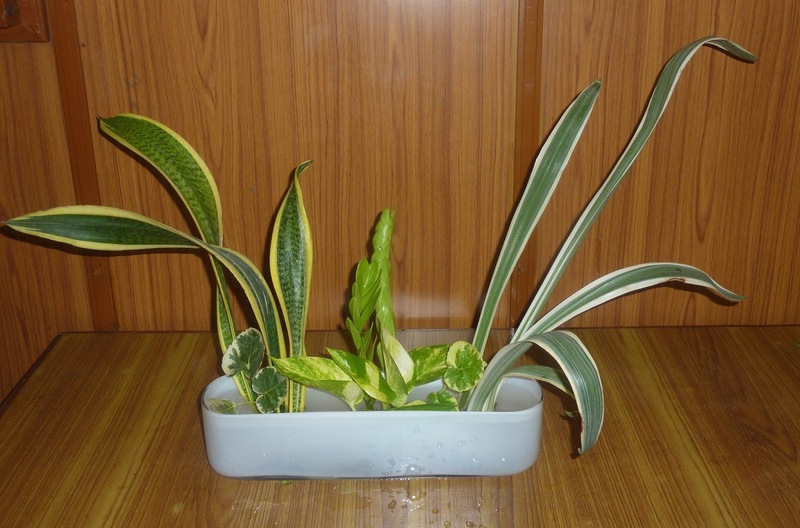 And this was the dramatic result. With those inspiring demo pieces, we got down to work. 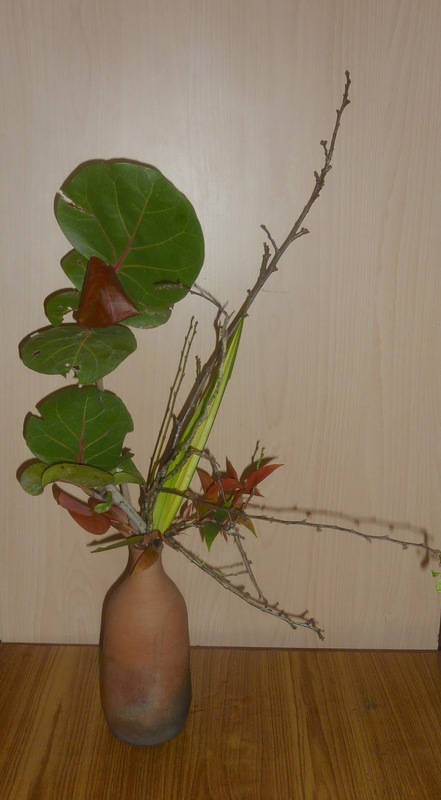 Sensei Dalley used leaves of the Sea Grape, with assorted material from her garden, to create this composition that reminded us of Autumn. 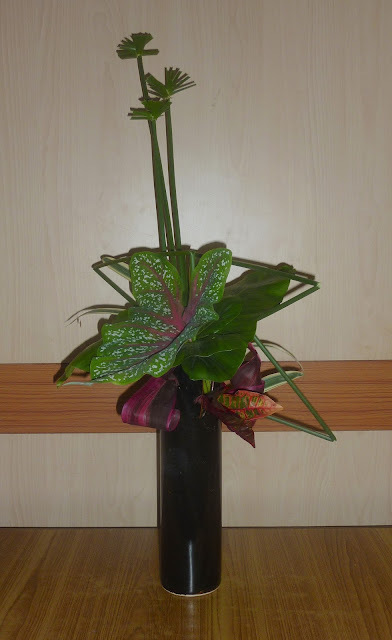 Chitra Thiagarajan also used a nagiere vase, but combined line and mass with umbrella plant, caladium, dressina and croton leaves for this striking composition. 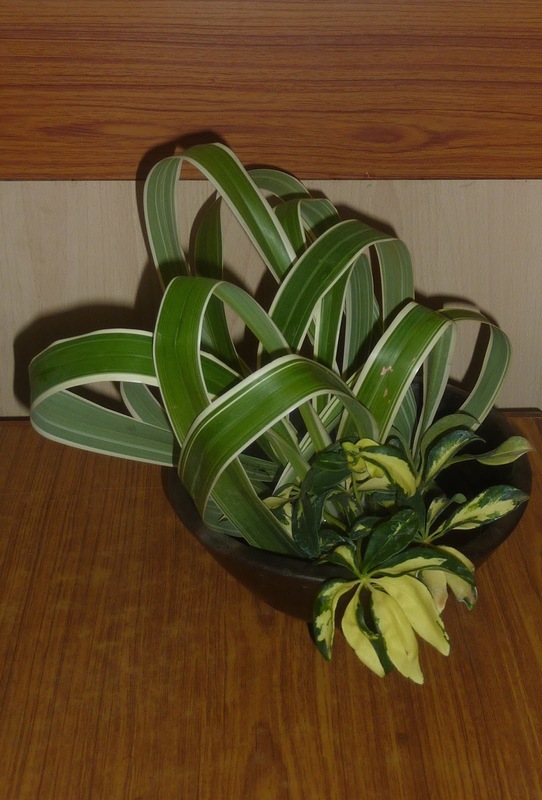 With lines that seemed to flow from the vase through the composition, sensei Malathi created this magical all leaf composition with aspidistra and leaves of the spider lily. 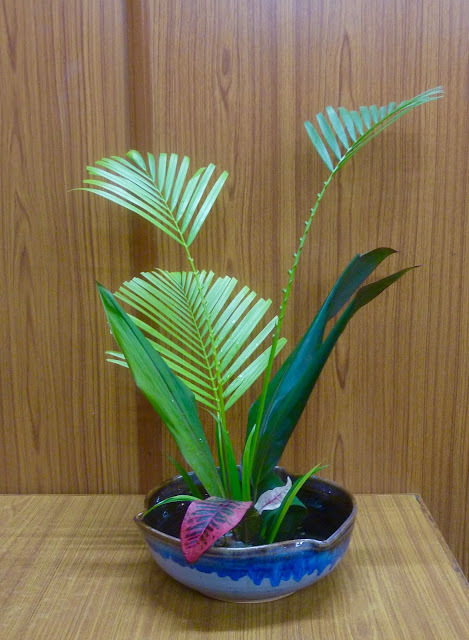 Sensei Divya created this tabletop composition with this common decorative leaf, contrasting it with the terminalia leaves in the foreground. 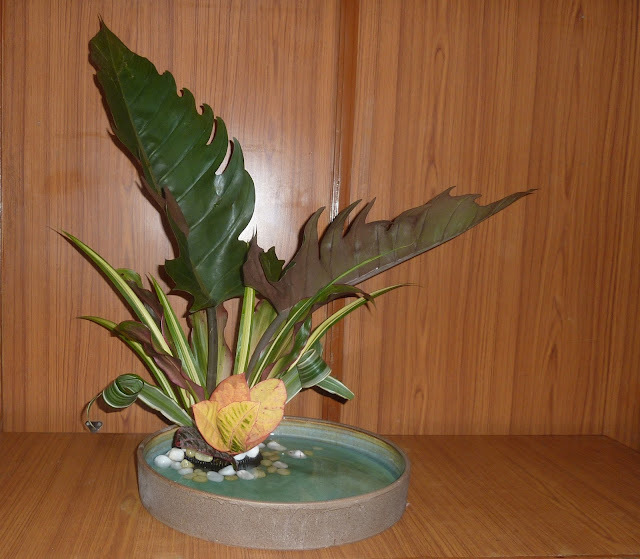 Bhuvana used palm, lily leaves and crotons in this naturalistic moribana all-leaf. With vases that seemed to match the ABK curtains, Chelvi's arrangement was a study of surfaces, combining monstera leaves of various sizes and shades quite beautifully and dramatically. Pushkala experimented with sansavera and assorted unidentified material from her environs in this moribana. 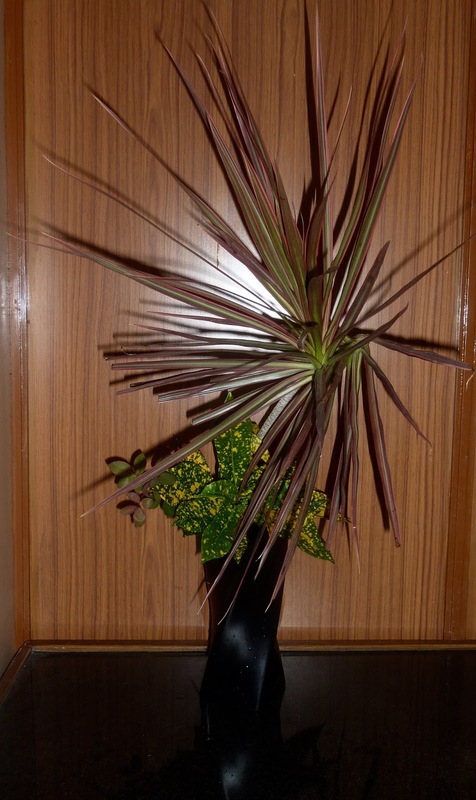 Ambika used a black ceramic vase, and complimented the twist in the vase with the spiral of the dramaitc brown dressina. 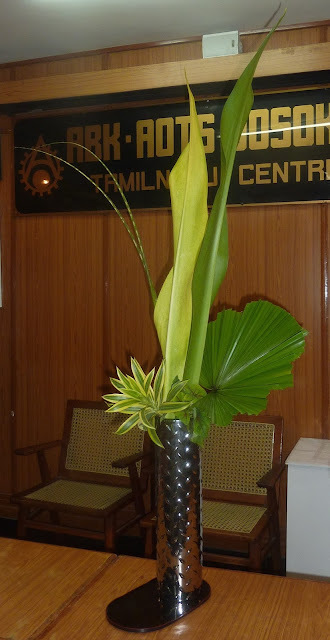 this was balanced by the yellow an green crotons lower down, while the new rose leaves mirrored the colours of the dressina.